These are the 12 new wallpapers that have landed in Ubuntu 12.10 after the close of the community wallpaper contest. Whether these will be the wallpapers on final release day remains uncertain, but most likely will be included. Cencoroll is not your average mass-produced anime from well known companies. 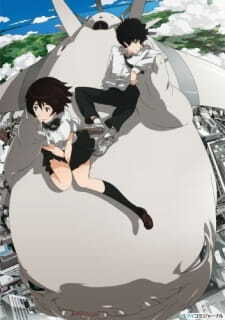 Rather it was a short film nearly singlehandedly written, designed, directed, and animated by manga author Atsuya Uki. What it differs from most anime is the simple illustrations, story telling, yet beautifully composed piece of art. When a gigantic, unearthly monster suddenly looms on the skyline of a Japanese city, the expected occurs—the Japan Self-Defense Forces roll out the tanks while the public panics. Nobody knows what it is or where it came from, but Yuki, a bold and inquisitive teenage girl, has a secret but might be a useful clue. Her friend Tetsu has been clandestinely caring for a bizarre creature called Cenco, which will soon prove itself to have some remarkable, even impossible characteristics. Another teenage boy, a stranger with some mysterious link to the monstrosity attacking the city, shows up, and his unwelcome interest in Tetsu's pet snuffs out any doubt of a connection—and lights the fuse for the coming battle. The story is quite simply presented through visual elements and character interactions. At first, you may not understand what is going on, and you're not meant to; but then you slowly start to accept this interesting development of a story of what seems a city with bizarre creatures. Not much can be explained at what is happening in the anime except that we must use our imagination to make-up for the lost content. Simply put, the story is about random bizarre creatures suddenly appear in a city and a couple of teenagers are taking care of such creatures called Cenco. Another teenage boy comes along and tries to disrupt the peace and so Yuki and Tetsu must defeat him to protect the city from harm. It was a limited story, but in the end, the overall presentation just makes you wonder if this short film would be able to be turned into a fully fleshed-out anime series. At first, I was unimpressed by the art. It felt rather washed out and bland. However, a few minutes in, I started to notice that the backgrounds were in-fact real still images from a city in Japan. Multiple filter and effects were applied to these still images to make them appear as if they were drawn. It was actually really well done and was pretty flawless. I was impressed how an anime can be based off still images from a real environment. The animation of the characters were really well done and blended in with the still images really well. The creatures definitely looked intriguing and were like white blobs that can shapeshift. The voice acting was pretty bland and unemotional; but is expected from a low-budget short film project. Although it really didn't stand out to me that much, I must admire though the effort that was put in to actually produce some decent voices to the characters. Background music was pretty limited and there was no opening song. The ending song was "Love & Roll" by Supercell, so that was quite enjoyable to listen to. Character-wise, the story didn't explain much about them. However, from their speech and locations, you could tell they were in their high school years. Yuki is what you can describe as a friendly and caring person whilst Tetsu is more reclusive and doesn't want to inconvenient anyone. Yet, despite their differences, Yuki and Tetsu manages to eventually get along with each other. There really is nothing else to explore of these characters as no further information is given. Everything you see is what you get. I thought this one one terrible anime, until I read that it was a project by one man for a short film festival. That drastically changed my attitude towards Cencoroll. The imagery was quite effective, and the effort put into this short anime is quite commendable. I must say though, this is probably considered like "indie" games and songs. It's all hard work to produce something decent. In the end, I did not dislike it yet as much as I thought I would have. If you view this anime thinking that it was a huge effort to get it produced, you will come to appreciate watching the anime. The story was really simple, gets straight to the point, and does not expand further. I must admire the use of real still images to portray an anime. Animation of characters and transitions was pretty good. Voice acting was pretty bland and music was really limited. Well, they all felt the same to me, from their interactions with each other. Very little character development. So there was some fight scenes between the two guys and their pets. Apart from that, enjoy the scenery. Initially I gave this a lower rating, but after reading up on the development history, I decided to raise the rating a bit higher. Another month has ended quickly and over half the year has passed. So let's recap on what happened in the month of August. 2 August saw Temple Run hit the 100 million downloads mark after just a year of release. Another milestone to take note of was Google Chrome's popularity rising to the top of the browser market share on August 7. For all those Linux users that use Ubuntu Tweak, the software was updated to support Ubuntu 12.10. THis happened on 13 August. 15 August was an important date for My Bubbletea Time! We finally hit 10,000 hits to the website! Thank you for all your support! Another important date was 16 August where the Humble Bundle for Android 3 was available for purchase! Although it didn't reach a world record, it was still widely popular. 21 August gave us a surprise that we never suspected. The announcement of a mysterious website and the hints of a The World Ends With You sequel. However, the game that was announced was the a sequel but rather an iOS remake, which left many fans disappointed. Another announcement was made on 24 August in which Microsoft unveiled it's new logo for the company. There were mixed reactions to the new logo with many disapproving of it. 25 August was a devastating day where Apple managed to win its patent lawsuit case against Samsung. This brought much criticism and rage among Android fans and smartphone users worldwide. So that pretty much covers August of 2012! It seems like there were plenty of eventful days from product announcements to terrible lawsuits. What will September bring?